ALISO VIEJO, Calif., March 28, 2018 /PRNewswire/ -- Microsemi Corporation (Nasdaq: MSCC), a leading provider of semiconductor solutions differentiated by power, security, reliability and performance, today announced its radiation-tolerant AAHS298B eight-channel source driver for space applications, which has been successfully qualified and certified by the U.S. Defense Logistics Agency (DLA) as Qualified Manufacturers List (QML) Class V and Q, with four Standard Microcircuits Drawings (SMDs) listed, is now in production. Offered in two package types with various screening options, the device has met the key requirements to operate in space environments, as the qualifications are mandatory for design-ins for space programs and for manufacturers to be listed on the QML by the DLA. "Successfully achieving these qualifications is vital to securing design-ins in satellite programs requiring the highest quality and reliability performance," said Dorian Johnson, Microsemi's high-reliability product marketing manager. "Obtaining QML status not only demonstrates Microsemi's continued commitment to supplying integrated space solutions, but gives our customers the added assurance that our radiation-tolerant AAHS298B source driver can meet the demanding requirements of the DLA while offering the ability to use the device in conjunction with our LX7730 telemetry controller, LX7720 motor controller and LX7710 diode array devices." Microsemi's high-performance AAHS298B source driver provides an interface between spacecraft bus electronics and other subsystems, with the highest output source current for space applications requiring radiation tolerance. Command signal outputs from the spacecraft's digital control electronics are typically TTL (5-volt) (V), CMOS (3V) and high-level (12V) logic and are not directly compatible with users' command input requirements. These user requirements occur in payload, power, thermal and housekeeping subsystems and range between 14V and 45V. The AAHS298B is an interface between these systems, providing a continuous 700 milliamps (mA) current to switched high side-drivers on the output. The integration of eight non-inverting high side channels gives satellite designers reduced weight, resulting in smaller board space, and higher reliability as compared to discrete implementations. 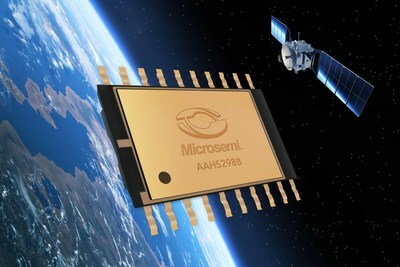 As many satellite manufacturers and projects require the DLA QML certifications and listings as assurance the product meets Military Performance Specification (MIL-PRF) requirements, the AAHS298B meets these standards as part of the company's growing portfolio of mixed signal integrated circuits (ICs) for demanding space applications. "Increasing requirements for higher output currents combined with demands for weight and board space reductions were compelling reasons to initially investigate Microsemi's AAHS298B source driver for our designs," said Glenn Lommasson, vice president of Design & Development Engineering Services (DDES) Corp. "In addition, the presence of the internal clamp diode in the driver output allowed a much more efficient method for implementing transient protection during inductive kickback events, which reduced the number of clamp diodes needed in other solutions. The recent device qualification and SMD listing as a QML-V device was also a very important element for us to baseline this part as more programs are mandating Technical Operating Report (TOR) guidelines for parts quality, DLA certification and radiation assurance." According to Euroconsult's 2017 report titled, "Satellites to Be Built & Launched by 2026," 300 satellites with a launch mass over 50 kilograms will be launched on average each year by 2026 for government agencies and commercial organizations worldwide. This represents an average of $30 billion per year for the space industry to build and launch them, representing a 25 percent increase over the past decade. Microsemi's expertise in mixed signal space solutions comes from over 20 years of custom and standard design and manufacturing experience in providing its customers with innovative space system solutions. As satellite manufacturers typically require Class V and Q qualifications, the designations provide customers with an added level of assurance that the radiation-tolerant AAHS298B eight-channel source driver has met the stringent industry standards. The QML qualification achievement allows designers across the entire spectrum of space designs, from low cost commercial and scientific applications to human rated and top priority government systems, to use the parts without cumbersome part selection justifications or source control drawings. Microsemi's radiation-tolerant AAHS298B source driver is available in production quantities now and is listed under SMD 5962-15231 with the DLA. For more information, visit https://www.microsemi.com/product-directory/drivers-high-side/5097-aahs298b or contact support at https://www.microsemi.com/product-directory/support/4195-contact-support. With one of the industry's most comprehensive portfolios of space products, Microsemi provides radiation-tolerant field programmable gate arrays (FPGAs), radiation-tolerant mixed-signal ICs, radiation-hardened DC-to-DC converters, precision time and frequency solutions, linear and POL hybrids, custom hybrid solutions, and radiation-hardened discretes including the broadest portfolio of JANS Class diodes and bipolar products. Microsemi is committed to supporting its products throughout the lifetime of its customer programs. The company continues to innovate and expand its portfolio, which includes its LX7730 radiation-tolerant telemetry controller IC, the LX7720 radiation-tolerant power driver IC with rotational and position sensing, as well as its RTG4™ high-speed signal processing radiation-tolerant FPGA family. The RTG4's reprogrammable flash technology offers complete immunity to radiation-induced configuration upsets in the harshest radiation environments, requiring no configuration scrubbing, unlike SRAM FPGA technology. For more information about Microsemi's space products, visit http://www.microsemi.com/applications/space. "Safe Harbor" Statement under the Private Securities Litigation Reform Act of 1995: Any statements set forth in this news release that are not entirely historical and factual in nature, including without limitation statements related to its radiation-tolerant AAHS298B eight-channel source driver for space applications, which has been successfully qualified and certified by the U.S. DLA as QML Class V and Q, with four SMDs listed, is now in production, and its potential effects on future business, are forward-looking statements. These forward-looking statements are based on our current expectations and are inherently subject to risks and uncertainties that could cause actual results to differ materially from those expressed in the forward-looking statements. The potential risks and uncertainties include, but are not limited to, such factors as rapidly changing technology and product obsolescence, potential cost increases, variations in customer order preferences, weakness or competitive pricing environment of the marketplace, uncertain demand for and acceptance of the company's products, adverse circumstances in any of our end markets, results of in-process or planned development or marketing and promotional campaigns, difficulties foreseeing future demand, potential non-realization of expected orders or non-realization of backlog, product returns, product liability, and other potential unexpected business and economic conditions or adverse changes in current or expected industry conditions, difficulties and costs in implementing the company's acquisitions and divestitures strategy or integrating acquired companies, uncertainty as to the future profitability of acquired businesses and realization of accretion from acquisition transactions, difficulties and costs of protecting patents and other proprietary rights, inventory obsolescence and difficulties regarding customer qualification of products. In addition to these factors and any other factors mentioned elsewhere in this news release, the reader should refer as well to the factors, uncertainties or risks identified in the company's most recent Form 10-K and all subsequent Form 10-Q reports filed by Microsemi with the SEC. Additional risk factors may be identified from time to time in Microsemi's future filings. The forward-looking statements included in this release speak only as of the date hereof, and Microsemi does not undertake any obligation to update these forward-looking statements to reflect subsequent events or circumstances.